Another awful day in Cape Town, which again lives up to its reputation, The Cape of Storms, but we don’t allow that to put a damper on our spirits. I would like to remind one to “pay it forward” and make a huge pot of thick, steaming hot stoup to carry with one on the days journey, and pass the heart-warming lekkerlicious cup on to those one comes across on the days journey who is in need of this random act of kindness, good idea, neh! Doen ‘it today. The week draws to a close, where does the time go, eh. Tomorrow, Friday on All Jazz Radio the live streaming day starts at 10am Central African Time with another edition of Jazz Rendezvous where one will discover some new music and artists that abound in the great world of jazz. The independent jazz artists of the world continue to surprise with some incredibly good music that one seldom hears on any of the radio station of the global village, therefore we try to find that Jazz Blues, Latin and World Jazz to share with the jazz lovers of the world, tune in to Jazz Rendezvous weekday’s from 10am C.A.T. Then at 2pm be sure to join Rudy Nadler-Nir for another journey into the world of Latin Jazz during his program, The Latin Side. Each week Rudy wears his passion on his sleeve as he shares the rhythms of South America with the music lovers of the global village. From 4 to 6pm C.A.T. 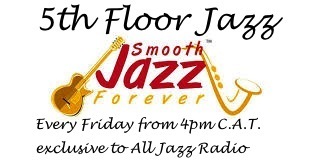 we head up to the 5th Floor for a heady mix of jazz from all corners of the world with a strong leaning to Contemporary Smooth Jazz sounds and again we will share the music of some incredible new artists that few have heard of before, exciting stuff, not so? Remember the best place to start the weekend on a high musical note is only found on All Jazz Radio, all day, everyday. If it’s not yet been done, one must do it right now, please subscribe to the All Jazz Radio website at www.alljazzradio.co.za and then go and LIKE the All Jazz Radio Facebook page and JOIN the All Jazz Radio Facebook Group, don’t forget to also FOLLOW us on Twitter at @AllJazzRadioSA too. Make your requests for your favourite, Jazz, Blues, Latin and World Jazz music by sending an email to info@alljazzradio.co.za with REQUEST in the subject line of the email. Have a wonderful day.